1. Mix the yeast with 1 tsp of sugar and 50ml lukewarm water and leave for five minutes until dissolved. 2. Mix together the remaining sugar, flour, salt and dates. Mix the butter with the mashed and dried bananas and stir in the yeast mixture. Stir into the flour with up to 50ml lukewarm water. 3. Mix together to form a dough. 4. Knead the dough on a floured surface for five to 10 minutes until smooth. Place in an oiled bowl, cover and leave to rest in a warm place for one hour. 5. Knock the dough back and divide into three pieces. 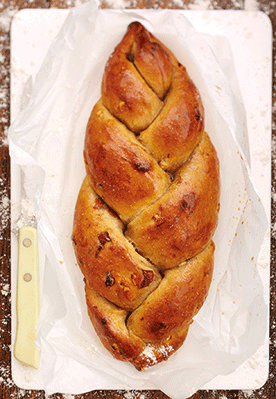 Roll each out to a 35cm sausage and plait all three together. Place on a baking tray and leave in a warm place for one hour. 6. Bake in a preheated oven at 180°C fan/200°C/400°F/Gas 6 for 25-30 minutes or until golden. Once out of the oven, mix tsp ground cinnamon with 2 tbsp of honey and brush over the warm loaf.